Today I've got to travel back to London, 2 fights, loads of trains, taxis and tubes and I'm guessing a ton of delays here and there - but it's totally worth it. The hurricane changed the fishing we were expecting, but with Paulos' years of experience he managed to adapt and still find sharks - top work that man! 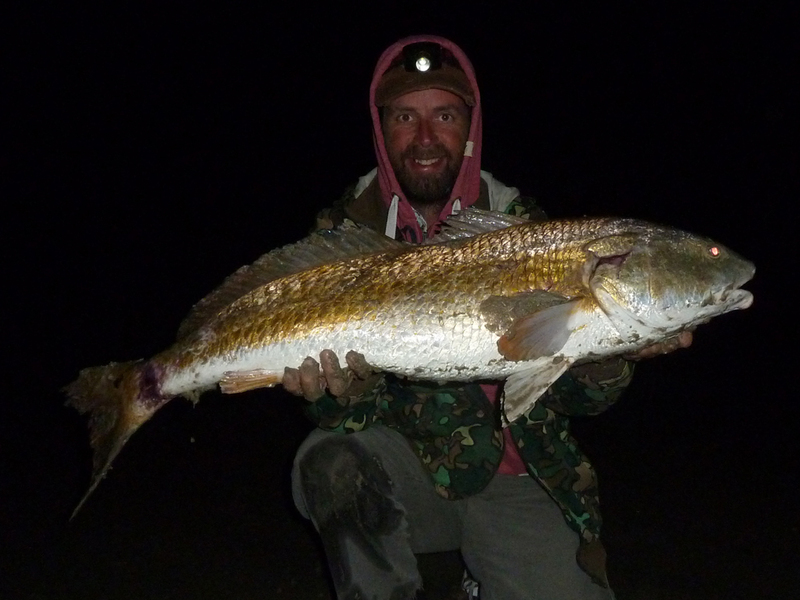 Me and Paulos were sat on a deserted beach under the stars, talking about the trip - 20 sharks and a dozen red drum, plus a monster stingray for me - far better than I'd even imagined. But Paulos was determined to catch another and send me home on a high note, after all we hadn't blanked yet! 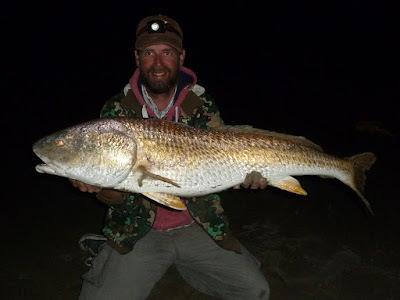 The weather had really turned and it was properly cold now, the last of the sharks will be heading south and the red drum disappearing to wherever they go. First up was a take on the shark rod, a big bait had been taken by a red drum, over gunned for the fight I wound in the 38' red drum (below). It's hard to see from the photo but this fish had recently been attacked by a shark, a hole in the gill plate and a still bleeding bite to the tail - tough fish! An hour later a run on the lighter gear, a very hard fighting red drum that really didn't like the beach, tearing off into the surf each time it touched sand. And a new PB of 44' to end on - what a trip!